Daejeon Hanbat Sports Complex is a sports complex, comprising a general purpose stadium (including atheletic facilities and a soccer pitch), a ballpark, Basketball courts, tennis courts and various other sports facilities in Daejeon, South Korea.The main stadium has a capacity of 20,618 and opened in 1964. It was used by Daejeon Citizens before Daejeon World Cup Stadium opened and the team relocated in 2001. It hosted several football preliminaries during the 1988 Summer Olympics in Seoul. Baseball park was opened in 1965, and undergone a significant renovation and expansion in 2012. It now has a capacity of 13,500, and serves as home for Hanwha Eagles of Korea Professional Baseball League.Chungmu Gymnasium is an indoor sports facility that can be used as basketball, or volleyball stadium. 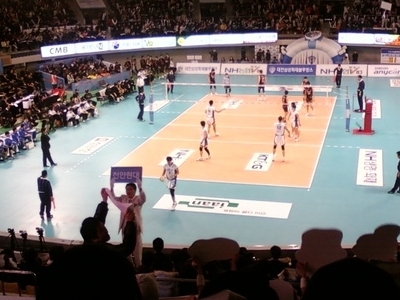 It currently serves as home for Samsung Fire Bluefangs of Korea Volleyball Federation. Here's the our members favorite photos of "Sporting Areas in South Korea". Upload your photo of Daejeon Hanbat Sports Complex!